Star Wars Rebels has provided fans with a look at the early days of the Rebellion. At times, it's been a little strange watching Rebels, because I keep find myself wondering what happens to the characters between now and A New Hope. I assume most of them have to have been killed at some point, maybe some kind of huge sacrifice that helped move the Rebellion to the next level. Otherwise, maybe we will get Disney Special Editions with the Rebels characters being added via CGI to the original trilogy. I am not advocating for that idea...please put down the pitchforks. Throughout Rebels first season, Kanan has been pretty stingy about giving his back story. We knew he was a Jedi at some point, but not much else. This miniseries is set during the Clone Wars and looks to fill in some of the blanks. We find out that unlike Obi Wan "Ben" Kanobi, Kanan has changed his name since he was a Jedi. He was once a Jedi Padawan named Caleb Dume. His master was named Depa Billaba. During the Clone Wars, Depa hand selected him as her Padawan just before she was assigned to a planet called Kaller. Kaller had been a Federation garrison, that the Republic had taken over. But the citizens of Kaller didn't seem to think life under the Republic would be all that better for them. Depa seems to have her own issues with the Republic and the Jedi order, especially their involvement as a military body. Caleb seems to think Depa's thoughts are borderline treasonous, but he seems to trust his master. Depa wants to change the minds of the people of Keller, and refuses to ask them to house her like they did the Federation troops. Depa and her team end up living in tents outside Keller's major city. Caleb seems to be inquisitive, and friendly with the Clone Troopers under their command...which is going to make for an awkward second issue. The first issue ends with Chancellor Palpatine sending out Order 66 saying the Jedi are all traitors and need to be killed immediately. I have read a lot of Star Wars books over the years, and for me, the best ones have always expanded on minor characters or told stories away from the main characters and action. While I have enjoyed Marvel's recent Star Wars releases, I really didn't want to read more stories about Princess Leia and Darth Vader. To me, series like this are far more appealing to me. Kanan has always seemed to have an interesting story to tell, and I'm glad that Greg Weisman is getting the chance to tell it here. I also thought Depa Billaba was a real interesting character. There were definitely some strong political ideas here in terms of military occupation and how war is viewed by those who are impacted by war even if they are not directly fighting. But it's done with a light touch, so you don't feel like you are being preached to. The scene with Depa deciding that they would sleep outside to prevent having to occupy someone else's house was just real powerful. 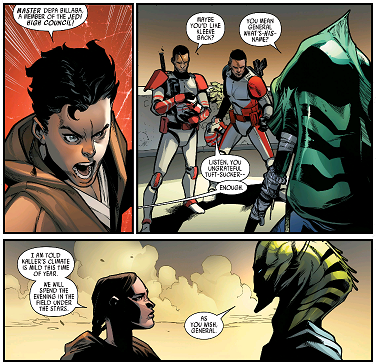 I also liked that they never seem to try and draw obvious parallels between Kanan as a child and Ezra from Rebels. I kept waiting for Kanan to be an obnoxious streetwise kid with a heart of gold like Ezra, but they never went that route. Kanan questions everything, but he seems to be pretty by the book. Kanan wants to know why he's given an order, but he will always follow it. He's even shocked by the behavior of his master who seems far more willing to defy authority than Kanan is. The art on this book does a terrific job presenting us with the scale of what's going on. There are some great action sequences in the early parts of the book as the Jedi and Clone troopers take over Keller. 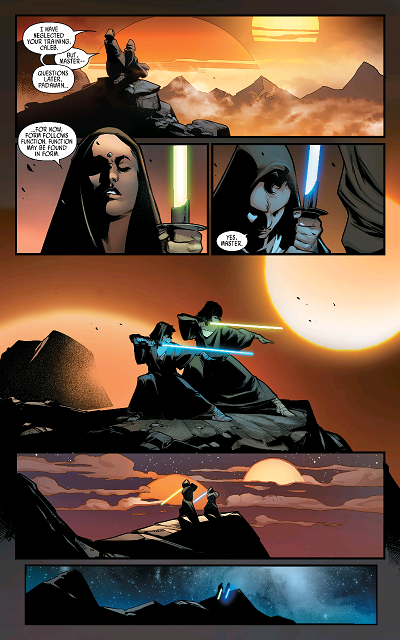 But, there also some great moments on a smaller scale where we seem the bond between Depa and Kanan. I really could hear John Williams score playing over this shot. There is virtually nothing I like better than an artist who can capture the balance between the action sequences and the character moments, and this book did it exceptionally well. Rebels has done a great job capturing what I love about Star Wars, and this issue definitely follows that same trend. Now I want to see one-shots and specials by Greg Weisman for the rest of the Rebels crew. Sadly, it seems like Weisman will no longer be working on Rebels for season 2, but I do hope he still does some work for Star Wars. This issue shows he definitely has the feel for it. Terrific insight into a chapter of Star Wars we don't hear much about. Social commentary without being heavy handed. This was by far the best comic I read this week. Captures the tone of Star Wars perfectly and features terrific writing and art. I honestly couldn't think of even a small nit pick this week to criticize. HIGHLY RECOMMENDED!